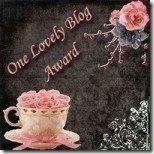 I just received my FIRST ever blog award! I am totally over the moon! Thank you so much J from https://boobiesbabiesblog.blogspot.com/ ! You so rock! I totally feel like I just won a Pulitzer! :) You have so made my day, no my week!!! So, now that that’s out of the way, I would love to pass this lovely award on to some of my favorite blogs! I hope rocks your world the way it has rocked mine:) You ladies entertain and provide a sisterhood to me that you may never understand. Enjoy! 1. Put this award on your blog, whether as an entirely new post like this, and/or on your sidebar. 2. Choose 15 other newly discovered bloggers that you love, and award them with this. 3. Send them a message/comment to let them know. Have a great weekend everyone & keep up the great work, as you all entertain and inspire me daily! Thank you so much for my award! It's my first ever and I am very surprised but also very thrilled so thank you again! I love your blog so keep up the great work and stories, I always look forward to reading them. Whaaaaaa! I loved your speech! Perfecto! And I proudly accept! Love your blog…keep it up. Thank you honey, you deserve that award very much! I am excited to come back and check out the other blogs! You deserve it, and are super sweet for passing it along – thank you!! Once I actually figure out how to post it on my low, low-tech blog, I will happily pass it along. Thanks for spreading the joy. Thanks so much for the award! And congrats to you for receiving one:) I love your blog-very refreshing and REAL! Thanks Ladies! You all really deserve this award (that's why I chose you) you keep me entertained and uplifted daily!Keep on keepin on! Great job!